If you are working on a project for which ready-made assay solutions including ELISA kits just don’t provide good enough validation or consistency, developing a custom assay is the best way to drive your research forward. And when it comes to custom assay development services could it be for research, CE marked or IVD purposes, ProteoGenix is the first choice of life science industry leaders, institutions and individual academic researchers. ProteoGenix Custom Assay Development Services are exhaustive and all-inclusive, with every aspect, from strategizing the custom assay in consultation with you to delivering the pilot kit, looked after under one roof. ELISA sandwich and competitive ELISA are the most common formats we develop. We guarantee to deliver the antigen and a pair of antibodies that detect your target in your samples. At the end of the process, we provide you with samples of the antibodies and antigen to verify the conformity towards the initial specifications. If you are satisfied, you pay the total amount. Otherwise, we charge 50% of the total cost only if we have been able to develop a sandwich ELISA against the antigen. Therefore, we take on the major part of the risk of your R&D or diagnostic project. Once you communicate your requirements to us, we study the provided specifications in great details to understand your research goals. Once we have determined that existing ELISA kits, ELISA sandwiches or antibody pairs aren’t sufficient to meet your requirements (specificity, sensitivity, cross-reactivity, etc. 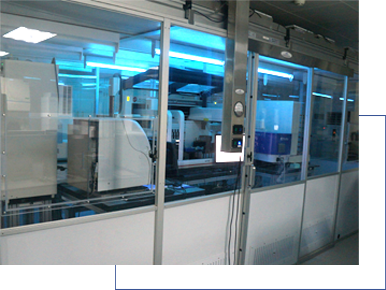 ), we design a fully customized strategy for assay development, in consultation with you. This is a very important step that determines the success of the projet. There are many possible strategies to develop an assay that meets specific requirements and every step of the process is critical. Our custom assay development strategy starts to materialize with double-stranded cDNA synthesis. With enhanced quality controls to guide our system, we guarantee 100% accurate sequencing, with an overall efficiency exceeding 99.9%. We further perfect our gene synthesis protocol with a run of gene mutagenesis to remove any traces of errors. 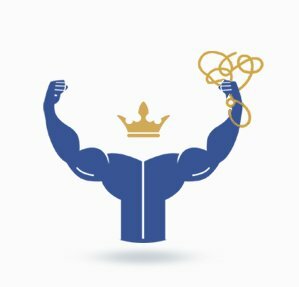 Over the years, we have established a formidable reputation of being among the best service providers when it comes to the successful production of custom reagents starting with accurate gene optimization and synthesis. Gene optimization and construction design are very important to produce at the next step the most suitable antigen. Precision driven production of recombinant protein chains or peptide with sufficient yield factor to sustain further antibody development is a vital step, as far as custom assay development is concerned. With an extensive expertise in this regard, we ensure that our custom Competitive ELISA, custom Sandwich ELISA or other assay formats’ development processes are built on a solid base of antibodies developed with efficient antigen production of high purity. Protein/peptide production, depending upon your project requirements and research goals, can also be expressed for sample delivery in best-fitting systems, including E.coli, B.subtilis, yeast, insect cells (baculovirus) and mammalian cells, to diversify downstream procedures in assay development. If need be, our team of scientists will also express recombinant protein or peptide in all these systems in parallel, so as to find the best expression conditions and improve the end-result validity of the antibodies used in the custom assay commissioned by you. We go about great care while developing primary antibodies from the antigen sample generated in the earlier step. As you must be aware, this is perhaps the most sensitive process in the custom assay development project, and that’s why, we have developed along the years an expertise in monoclonal and polyclonal antibodies that is peerless. Along with the cutting-edge techniques and equipment available in our labs, it’s also noteworthy that all of our animal facilities are AAALAC International accredited. Upon successful production of desired primary antibodies, we set in motion our analytical services. Prior to conjugation, we offer three advanced, label-free techniques of antibody affinity measurement to gauge the levels of biomolecular interactions. 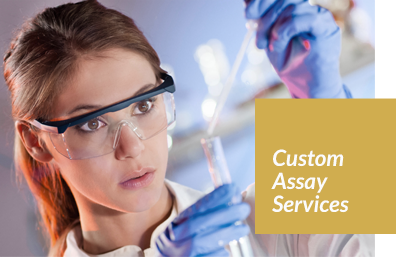 The next step in our custom assay development services is the conjugation of antibodies. Thanks to the purity of antibodies produced in the earlier step, we can guarantee that the end-result of antibody conjugation will contain no stray protein chains or amine groups that can have a bearing on the conjugation process. Using the latest advanced techniques with a choice of multiple labelling methods, we leave no stone unturned to successfully accomplish this vital step towards accurate assay development. Working in symmetry with primary antibody development processes (see step 5), we determine and develop the best matched pairs of antibodies (coating antibodies and detection antibodies) for the custom sandwich ELISA assay. We carry out at least 90 pair matching tests to make sure that the most suitable antibody pair is selected. The accuracy of a Sandwich ELISA kit will wholly be a direct function of successful matching, and hence, it’s important to go with an experienced custom assay development supplier like ProteoGenix who masters all the process from gene synthesis to kit pilot productions. 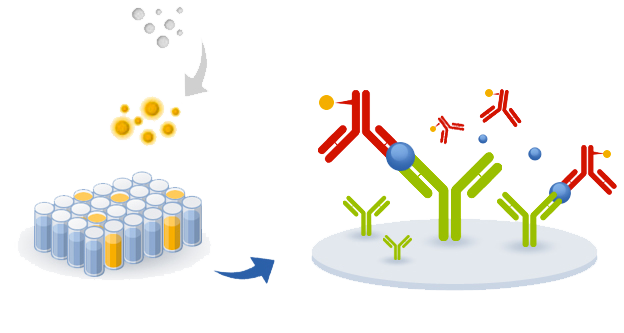 Based on the uniqueness of the target antigen and the desired antibody sensitivity, we proceed to develop a fully optimized ELISA protocol (Sandwich ELISA, Competitive ELISA or other format). The development of Sandwich ELISA or Competitive ELISA protocol drives the custom assay development project towards completion. The purpose of this step is usually to optimize the signal, sensitivity and reproducibility while reducing the noise/background to the minimum. Towards the conclusion of the custom ELISA development process, the developed custom assay is validated on the assigned biological samples to ensure that the detection of endogenous protein(s) in question is successful. Assay validation also provides veritable assurance that the target detection is consistent with recombinant protein/peptide developed. Once the custom assay is fully developed and validated, we seek our customers’ approval to go ahead with the pilot production of kits. Keeping in line with our thorough approach regarding all procedures that custom assay development consists of; we deliver all the necessary reagents in fully developed and optimized states to facilitate the use of the custom assay in your laboratory. We eventually deliver dozens or hundreds of ready to use kits including pre-coated plates and all necessary reagents to perform the tests. Why Choose ProteoGenix Custom Assay Development Services ? Guaranteed turnaround in only 8 months from gene synthesis to Sandwich ELISA development based pilot kit batch delivery. 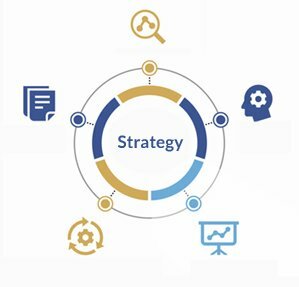 Let’s Drive Your Research Forward - Together! With the best-in-class equipment, highly qualified and experienced scientists on board and a reputation that precedes our name, we, at ProteoGenix, are fully committed to providing nothing but the very best custom assay development services to you – all at a fair price, and with extensive guarantees, end-to-end quality control and quick turnaround times. One step in the right direction saves you a hundred in the wrong one. So, let us bear the responsibility of developing and validating custom assays for you, so that you can drive your research further – much, much further! Click ‘Contact US’ on your right to get in touch with us, ask us questions or request a quote. Keep reading on to learn more about how our custom assay development services can add that much-needed time, effort & cost effectiveness to your project. At ProteoGenix, we have on board a team of eminent scientists with illustrious academic, research and industrial backgrounds. Having at helm such a wealth of experience, we possess incomparable expertise in molecular biology, protein engineering, antibody & immunology and peptide synthesis. Why Go for Custom Assay Development? While ProteoGenix offers a number of multipurpose custom ELISA services including Direct ELISA assay services, Indirect ELISA assay services, Sandwich ELISA assay services and Competitive ELISA assay services, custom assay development often emerges as the best solution when you require validation / production kit for projects project involving very specific targets or markers. We work with automated Sandwich ELISA and Competitive ELISA techniques to develop the best-fitting assay solutions for you. According to the requested sensitivity and technology, we can develop colorimetric assays as well as fluorescent assay. Our services include assay development for drug discovery but also for diagnostic or research purposes. With a long-standing commitment to the academic and industrial research community all over the world, we, at ProteoGenix, know what it takes to synergistically complement the countless hours you put into your research. Keeping the requirements of researchers in mind, we have developed a comprehensive custom assay development system that will take the pressure of validation and repetition of results off your shoulders. The uniqueness of the target in question. The capacity of the existing kit to meet your specifications in terms of sensitivity, assay format, species specificity or cross reactivity. The need to have your own assay to create a competitive advantage towards competitors and reduce the risk of copy. If you can’t decide, feel free to get in touch with us and we will be more than happy to advise. The best way to demonstrate our expertise in custom assay development is to share a representative case study of a biomarker assay we developed. The aim of this project was to develop and optimize a biomarker assay to detect high levels of a biomarker specific to the early stage(s) of prostate cancer previously identified. The sample set of serum donors for validation consisted of healthy individuals, individuals with breast cancer and target individuals, i.e. individuals with prostate cancer. Standard OHS screening protocol was deployed to identify the regulators of a common protein target of anticancer drugs. The following figure (FIGURE 1) illustrates the generic working principle behind OHS screening. The steps detailed below were followed to develop a Sandwich ELISA protocol for the biomarker discovered via OHS screening in the preliminary stage of the custom assay development project. Recombinant protein chain production was carried out in sufficient volumes and at above-threshold purity. 10 high affinity monoclonal antibodies were developed in a hybridoma system. All 10 monoclonal antibodies thus developed were produced, purified and conjugated. Thorough antibody pair matching exercise was adopted, with as many as 90 pairs tested for the most suitable match. 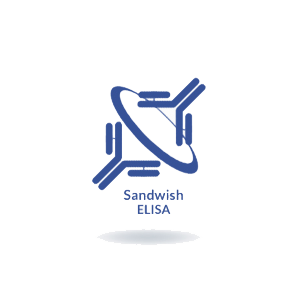 The most optimal Sandwich ELISA protocol was developed to reach a sensitivity threshold sufficient to detect the target in patient serum. The pair with the most suitable matching results was evaluated on labelled biological samples from a sufficiently large set of donors (healthy donors as well as cancer patients). Epitome mapping was followed by development of two-tiered cell banking setup consisting of a Master Cell Bank (MCB) and a Working Cell Bank (WCB). As described in the step 4 earlier, an antibody matching experiment resulted in a set of highly reliable data points that were tabulated, and graphically and empirically analysed to determine the most suitable pair match. The following graph (GRAPH 1) details the matching experiment results derived from matching various antibody pairs. As can be clearly noticed, Detection Antibody 4B and Detection Antibody 5B exhibit remarkably good pairing with Coating Antibody 17. Among these two contenders, the pair of Detection Antibody 5B and Coating Antibody 17 was noticed to provide consistently better pairing. Thus, empirical and experimental analysis of over 90 pairs allowed us to zero in on the best pair match. Once the best pair of antibodies is determined, using a Sandwich ELISA approach, a specifically optimized detection protocol was created. This involved the choice and usage of appropriate blocking buffers, along with suitable incubation periods, antibody dilutions and other parameters. The following graph (GRAPH 2) plots the concentration values against the associated OD, giving us a highly reliable and accurate empirical curve that can be used in the future for extrapolation needs as a part of the complete Sandwich ELISA protocol for this biomarker assay. Conclusion: this optimized Sandwich ELISA protocol allows detecting the biomarker at a concentration ≤0.2 ng/ml in patient blood samples. The evaluation of the custom ELISA Sandwich protocol was carried out using blood samples from healthy donors, breast cancer patients and prostate cancer patients. The optimized ELISA protocol was used to assay biomarker levels in samples compared to PSA levels. The following graph (GRAPH 3) illustrates the high levels of prostate specific biomarker in prostate cancer patients, as detected by the custom Sandwich ELISA protocol developed at ProteoGenix, enabling the categorical discrimination between non-prostate cancer patients (healthy donors and breast cancer patients) and prostate cancer patients. This discrimination was much clearer and more conclusive than when assaying PSA biomarker. This case study represents a lot more than just facts, figures and data. Such advancement and ability to customize the assay development process – otherwise a long, tedious and meticulous task – to this degree is a great asset to have at researchers’ disposal. Custom assay development not only provides solutions tailored for your projects, but it also saves precious time, energy and other resources that you would otherwise spend on trying to make standardized assays work. ELISA sandwich is usually a method to assay a protein (in blue in the chart below) in different kinds of samples such as serum samples using a pair of antibodies. The capture antibody (in green below) is quoted to the plastic of 96 well plates whereas the detection antibody (in red in the chart below) will allow a detection signal to be released. In an ELISA sandwich, the detection antibody can be directly conjugated to biotin, HRP or AP (in yellow in the chart below) but it is also possible to use a conjugated secondary antibody to detect it if the coating antibody is from a different host species.